The USAF has solicited ways and means of enhancing the abilities of our own troops by a variety of means. Not content with merely advantaging our own troops, they also seek to disadvantage the enemy. Goal is to develop and exploit advances in biotechnology and associated nanotechnologies to enhance performance and situational awareness of the force. Development of effective, reliable, and affordable alertness management, performance enhancing and emotional state modulation technologies. Includes non-medical neuroscience and biochemical pathway techniques. Fans of Frank Herbert's 1965 novel Dune recall sapho juice, favorite of Mentat Assassins like Thufir Hawatt, for cognitive enhancement. As I mentioned, the USAF-sponsored research request also seeks to find technologies that can be used to cloud the minds of our enemies, reducing their operational effectiveness. Conversely, the chemical pathway area could include methods to degrade enemy performance and artificially overwhelm enemy cognitive capabilities. 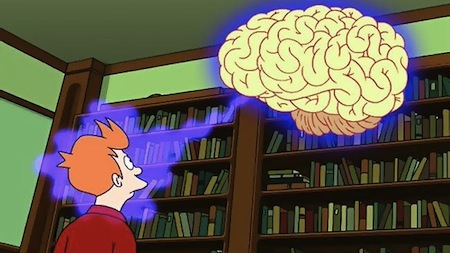 Fans of Futurama recall the stupid ray, which seems to be a pretty good description of what the USAF is looking for. Each pellet, fully cammed, begins to emit a sound... a horrid sneering sound. Buzzing... The point is, it keeps you awake... I mean wide-awake. Once the noise of a Garbage-can Banger gets to you, for example... you never sleep again... You can't perform your job. You're no good to anyone, yourself included." See also this description (with quote and citation, of course) of the Civic Notification Distorter, which accomplishes the same goal, but targets the enemy's information systems. From Advances in Bioscience for Airmen Performance (.doc) via News.com.au. Thanks to Moira for the tip on this item.